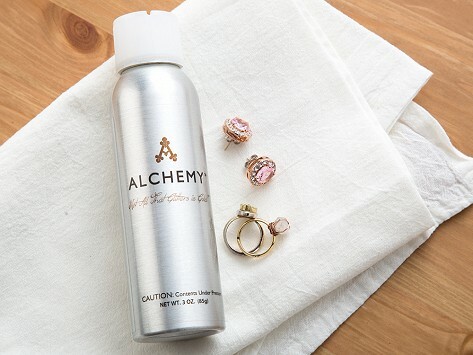 Alchemy is a quick-drying jewelry sealer that helps protect your skin from discoloration and irritation. Spray this water-based polymer onto rings, earrings, necklaces and more, and it provides an invisible barrier of protection between jewelry and skin. Please note: This item cannot be shipped to Hawaii, Alaska, or PO boxes. Travel size at 3 oz. Better than clear nail polish! Great way for me to finally wear jewelry. I have never been able to wear anything but gold but now i can wear anything as long as I coat it with alchemy. I have A PROBLEM BEING ALLEGIC TO SOME EARRINGS AND PURCHASED THIS TO HELP. IT REALLY WORKS. CAN'T SAY ENOUGH ABOUT THIS PRODUCT. NOW I CAN WEAR ALL MY EARRINGS AGAIN. I DO HAVE TO SPRAY OFTEN. Wear your favorite earrings, rings, necklaces, and more without skin irritation or discoloration. Simply spray jewelry with Alchemy and, once dried, you can't see it, feel it, or smell it. It’s working, though—like an invisible, barely-there barrier between jewelry and skin. Alchemy is a water-based, proprietary polymer blend that is easy to use: spray it on, let it dry, and your jewelry is ready to wear. Plus, it’s alcohol- and fragrance-free—meaning no harsh smell. And Alchemy actually protects jewelry as well, slowing the oxidation process, so it doesn’t tarnish as easily. Overall, Alchemy is a far better solution than putting clear nail polish on your baubles. As a jewelry Maker, founder Ashley Colonna was familiar with the problems metal can cause. She created Alchemy spray for people to enjoy their bling without worrying about it affecting their skin. With Alchemy spray, wear your jewelry with confidence and comfort.